V.12 reeds are manufactured from cane tubes of the same diameter as those used for saxophone reeds. This leads to a higher manufacturing cost, as large diameter cane is more rare. In comparing strengths, a V.12 strength 4 reed is almost equal to a Traditional strength 3 1/2 reed. Musicians who are not quite sure which reed will suit them best to the nearest 1/2 strength can be helped by the fact that the cut of these two types of reed is different. The tone of the V.12 is generally bigger and more consistent than that of the Traditional reed. 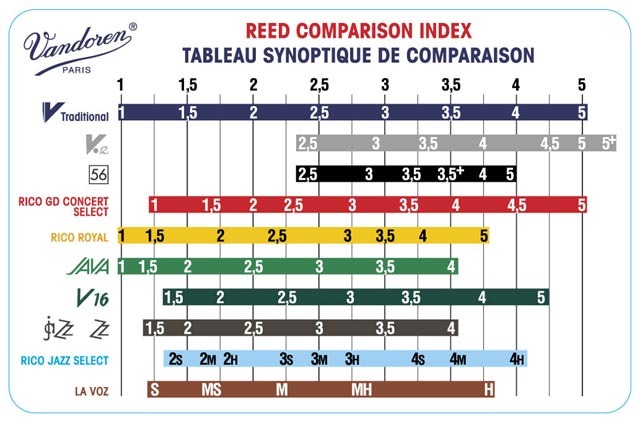 To evaluate the acoustic qualities of each type of reed, it is an interesting experiment to play them in various acoustic settings. Indeed, many professional clarinetists advise their pupils to keep both V.12 and Traditional reeds in their cases for the following reasons. When playing in acoustics where the musician feels that his reed sounds too 'muted,' he may choose a traditional reed to give him a better response and increased flexibility. Conversely, a musician finding his tone a little too bright (the so-called clear tone), might change to a V.12 to achieve a darker, warmer sound without an aggressive edge. Please Select strength required from drop down options. To receive our internet advertised prices when visiting our stores, you must ask for our advertised internet sell price. If you do not ask, you may not get. The V12 are the best reeds I've ever used. They have consistently produced a rich and smooth tone fo.. The V12 are the best reeds I've ever used. They have consist ..